This one got off to a tricky start. I didn’t re-read the chapter, and so missed out on some of the instructions, and took two weeks to complete this one. It’s okay, I’m doing this on my own and I can go at my own pace. This chapter, Cameron talks a lot about “crazymakers” (her word, not mine). People who turn up at inopportune times and wreck your plans with utter disregard for your feelings or wellbeing. I don’t seem to have any in my life – they sound like the sort of ‘friends’ I’ve avoided or excised – so, instead of trying to disentangle myself from them, I examined my own behaviour. 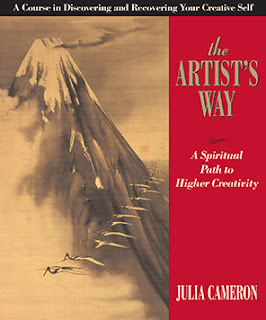 After all, Cameron said that such people are often blocked creative. I don’t thrive on attention – quite the opposite – and the idea of upsetting my friends genuinely concerns me. I could stand to do better (everyone could, probably), but the person I sabotage the most is myself. I had a chat with my therapist about them and he thinks they’re probably useful. He also suggested only writing two of them if time was an issue. I was hesitant – I’d noticed that I start to uncover some significant thought processes around the one-and-a-half-pages mark and didn’t want to jeopardise that, but he reckons that the brain – when confronted with a finite amount of time/space – will put off doing the important work until it absolutely has to and that, by shaving a page off my writing, I’ll come to the same conclusions half a page earlier. I’ve been trying that for a few days, and it seems to be working out. I planned to go somewhere new this week, but life intervened and I ended up gardening instead (making hay while the sun shines). 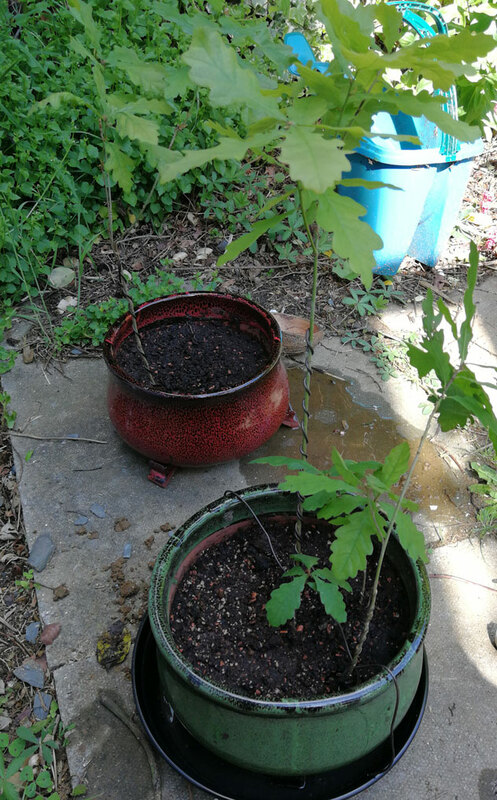 It’s been a while since I gardened and, in one of those fantastic coincidences, a chance conversation has reignited my old interest in bonsai at the same time that my weeding uncovered some oak saplings that had planted themselves way too close to the house, so I’m now the caretaker of two potted oak trees. Because I’m a shameless nerd, I’ve dubbed them Quirk and Robbie. Quirk (in the foremost pot in the photo), and is a single root ball with with four trunks; pragmatic and fmily-orientated. Robbie (in the hindmost pot) may have become detatched from Quirk while I was digging them up, but is now an independant young thing looking to establish his own identity (having given them name and personalities, their inevitable deaths as a result of my incompetence will crush me, but that’s future me’s problem). All things considered, this was a pretty chill week. The topics of my morning pages are still varying wildly – ideas for The Story With No Name one day, musings on mortality and grief the next, and whinging about how tired I am the day after. It’s a process and I am finding it useful; the switch to two pages doesn’t seem to have affected that too much. I rated adventure and spirituality as the weakest points of my life this week, and I’ve been trying to think of ways to fill them up. Meditation has, ironically, been pushed out of my morning routine more often than not because the morning pages ran long. That said, the weather’s nice so I’m in the garden more and been trying to pay more attention to my environment during my my lunchtime walks, and I’m feeling more grounded in reality than I used to. Having started this week with an attitude of “get it done and get to the good stuff”, I’ve been pleasantly surprised with how cathartic some of the exercises have been. The artist’s date – a page from a ‘mindfulness’ colouring book – was particularly refreshing, and the exercise to write a letter to a champion led me to look up my old art teacher and find he’s still exhibiting. writing the letters – short tasks are easier to fit into a busy schedule and, psychologically, ‘writing a letter’ is not a short task. When I actually got on with it, each letter was 20 minutes, tops. actually finding all the tasks – the Core Beliefs exercise, referenced in later weeks, is hidden in the middle of the chapter and I had to go dig for it. Lesson learned for the future – re-read the chapter before diving in. finding time to do the morning pages. Cameron says leave 30 minutes, but I’m clocking in about 50. My regular morning routine is suffering because, despite getting up earlier, I only have time to do my pages before rushing off to work. That said, they’ve led to some noticeable mood shifts, so they’re clearly unjamming something in there. I don’t know that my pages have led me to dwell on negative thoughts – beyond how blasted tired I am – but it’s something to keep an eye on. As far as the artist’s date activity goes, I also haven’t done anything resembling play for a very long time – a dearth of time and a surfeit of stress means all that went out of the window years ago – so I’m cribbing date ideas from Ellen Bard’s list 101 ideas to boost your creativity. This week’s date was a page from a colouring book. I’m sure the spooky ghooosts and creepy castles were seasonally-appropriate when I bought the magazine (back in 2015) – like I said: it’s been a while since I just let myself play around. It was really quite pleasant. And then I immediately regretted wasting an afternoon on such frivolity. Baby steps. I’ve got a long way to go, but I’m feeling generally positive. This week wasn’t too rough, except for the damage to my morning schedule. I’m looking forward to next week.